EXCLUSIVE Our Sweet Blooms Flower Arrangement is sure to delight with its uniquely elegant design. 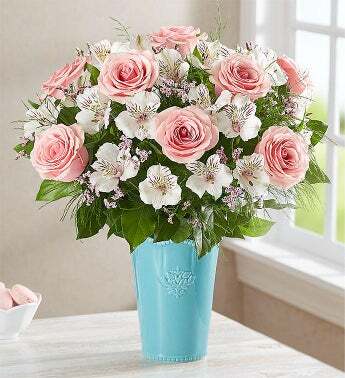 Delicate pink & white flowers are artistically arranged inside our keepsake glazed aquamarine vase for vibrant style. Inspired by handcrafted antiques, this striking vase flaunts an acanthus-leaf motif and scalloped edge trim with beaded detail, creating a special gift they’ll enjoy for years to come.